Since 1959 Sea Ray has been an iconic name with pleasure boaters the world over. 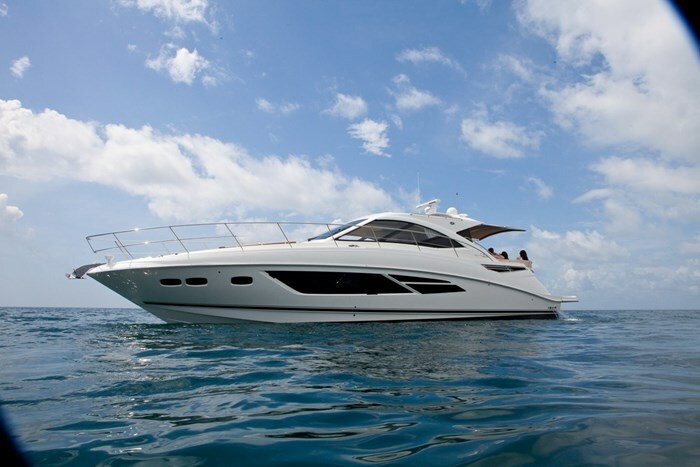 The Sundancer® model descriptor has been synonymous with Sea Ray almost that entire time. 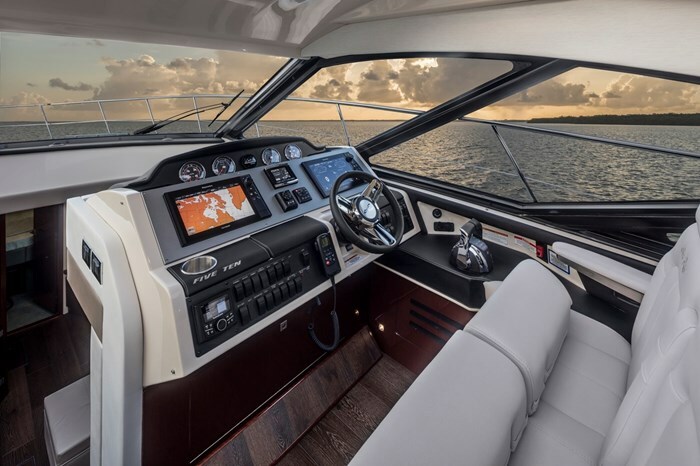 The Sundancer 510 is part of Sea Ray’s nine model Sport Yachts/Yachts series for 2018 ranging from forty to fifty-two feet. 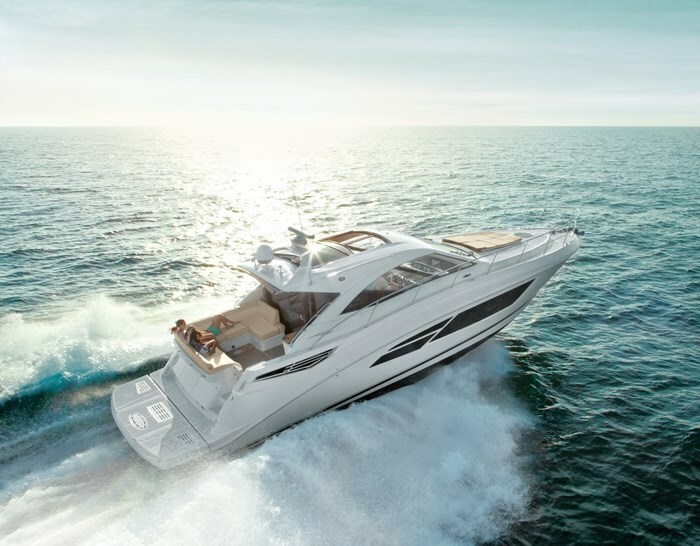 In all, Sea Ray offers forty-two models from nineteen to sixty-five feet in six series. What you usually may call a salon with a level floor from the cockpit transom through to the windshield, Sea Ray calls its Sunroom on the 510. This Sunroom features a hardtop with a quite large glass pneumatic retractable sunroof that, together with surrounding cabin windows and windshield plus a frameless, sliding, lockable, tinted glass Sunroom entry door allows copious quantities of natural lighting inside the climate-controlled environment. 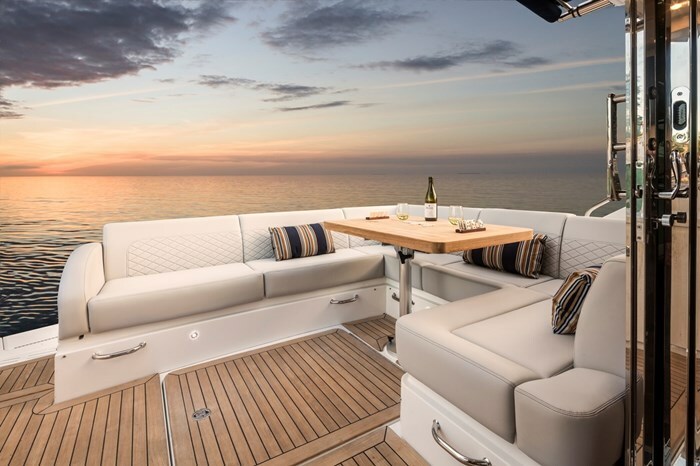 A commodious U-shaped port side cockpit lounge complete with a standard teak table provides plenty of outdoor seating and lounging together with the foredeck sun pad. 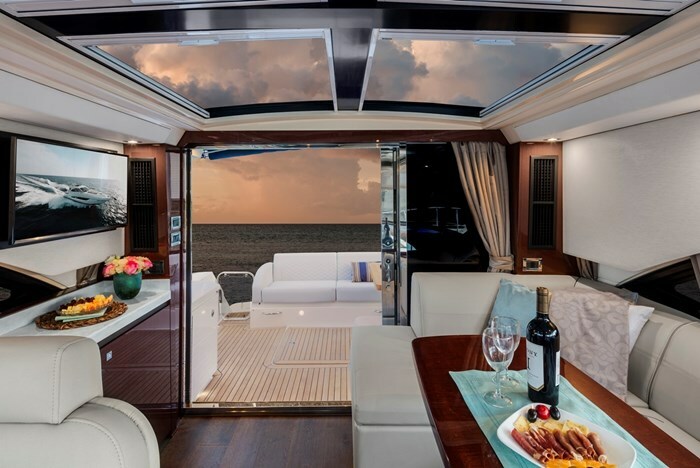 Upon entering the Sunroom from the cockpit, an L-shaped couch with polished wood table fills the entire port side while a wet bar with sink and refrigerator with a standard 32-inch LED TV with Blu-ray™ player above it fills the starboard side aft of the double wide pivoting helm seat with flip-up forward bolsters and armrests, and reclining backrests. 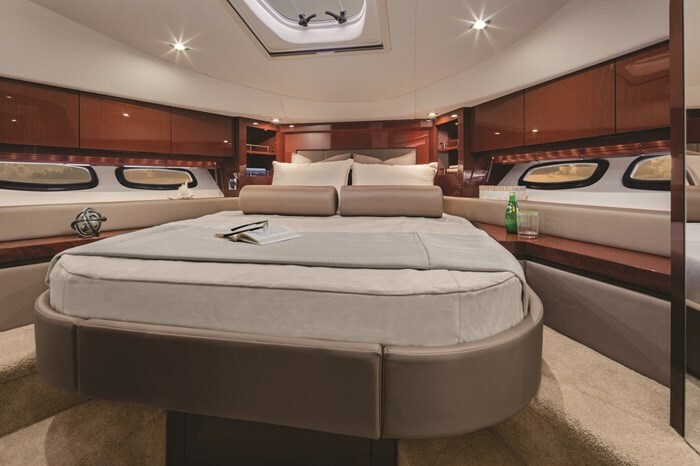 An open staircase leads to the salon in the lower cabin with its starboard side L-shaped sofa with pull-out bed. 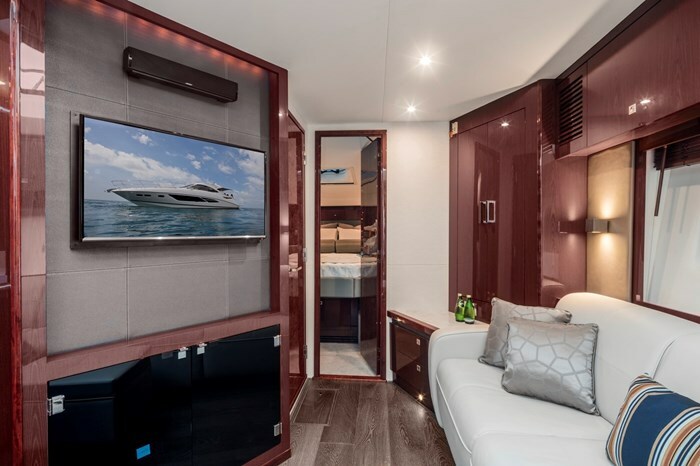 Opposite to starboard is an entertainment centre with a Smart 32-inch LED TV with Blu-ray™ player, storage cabinet, plus an AM/FM stereo, Sirius XM ® satellite receiver, MP3 Port, iPod® interface, and Gaming System ports. All cabinetry is satin finished French walnut. The lower cabin has its own air conditioning/heating. A solid wood door leads to the forward guest stateroom with its hull side windows, full-size, island bed with Elastic Foam mattress, hanging lockers, storage cabinets, 24-inch LED TV with Blu-ray® player, plus direct access to the day head with its VacuFlush® toilet, separate shower with acrylic door, vanity with vessel sink, towel cabinet plus a medicine cabinet with mirror. Another solid wood port side door with a full size mirror on the back leads aft to the master stateroom with its starboard side queen size bed with innerspring mattress flanked by built-in nightstands, a wall accent mirror, hanging locker, port and starboard hull side windows providing natural lighting, another 32-inch LED Smart TV with Blu-ray® player, plus a port side vanity with solid surface countertop, storage and vessel sink. 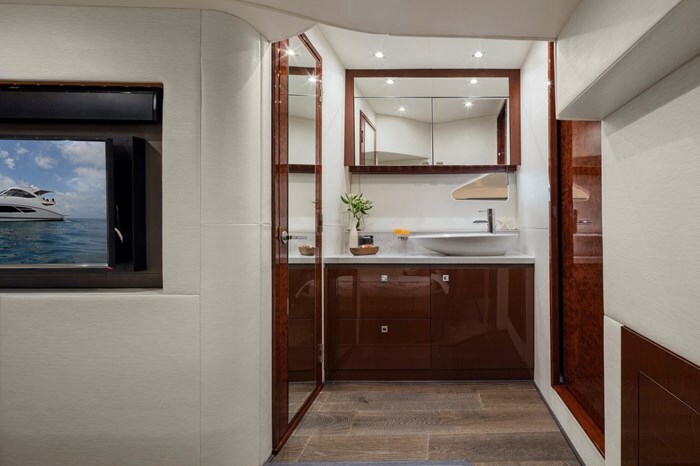 Aft of this is the private master head with VacuFlush® toilet and separate shower with acrylic door. Back on the main level, the multi-level dash with 360-degree surrounding visibility features Electronic Throttle & Shift Controls (ETS), SmartCraft® Diagnostics instrumentation with 4-in-1 Multigauges plus standard SmartCraft VesselView display showing additional engine, vessel, performance, and generator data plus cruise control, tank status, Trip Log, alarms, plus much more. Standard electronics includes a widescreen Raymarine® chartplotter/radar/GPS and VHF. Windshield defrosters plus wipers with washers are standard. Standard power is from twin 526 horsepower Cummins® QSC 8.3 T3-550 HO diesels with V-Drives. These may be optionally upgraded to twin 574 hp Cummins® 600-HO models still with V-Drives, or choose either of the above models but with Zeus® propulsion which comes standard with helm joystick, Skyhook® Station Keeper, and integrated autopilot. Bow and/or stern thrusters are available with or without Joystick Docking Control if you choose the V-drive propulsion. 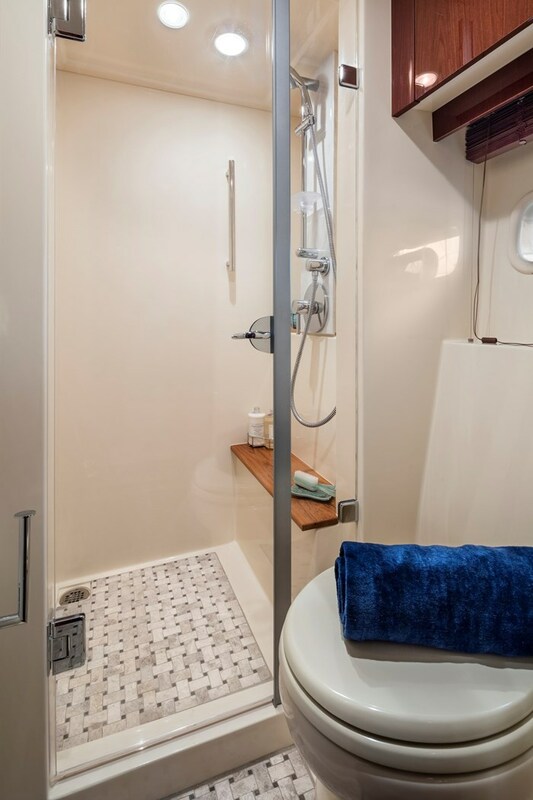 Additional standard equipment includes an 11.5 kW Onan® generator, shore power Cablemaster™ with isolation transformer, anchor windlass, remote spotlight, trim tabs, three washdown spigots, plus cockpit seat covers and a cockpit shower. Notable optional equipment includes a third stateroom in lieu of the lower salon sofa, Raymarine™ autopilot plus auxiliary displays and upgrades, audio system upgrades, light or dark quartz countertops, cockpit grill and/or icemaker, retractable, electric aft cockpit sun shade, hydraulic swim platform, washer/dryer, various table and decor upgrades, and cockpit canvas enclosure, among many more options. 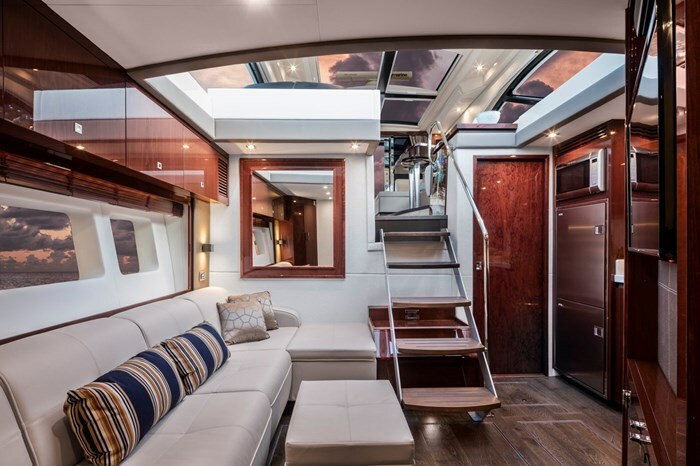 “Dissolving the separation between indoor and outdoor helped the Sundancer 510 win the AIM Marine Group Editor's Choice Award,” and it is easy to see why.